In a small saucepan, heat pomegranate juice with sugar and lime juice. Just heat the mixture until the sugar dissolves. It doesn't need to be very hot. In a small bowl, stir together water with gelatin. The gelatin should swell and it should basically turn into a paste. Slowly stir hot pomegranate mixture into the bloomed gelatin. The mixture should be without a lot of lumps. Stir in triple sec and tequila. Pour mixture into an 8x8 baking dish. Cover the mixture with plastic wrap and chill the mixture until it sets, about five hours at a minimum but overnight is best. Remove plastic wrap and slice shots into 25 even pieces (5 by 5 cuts). 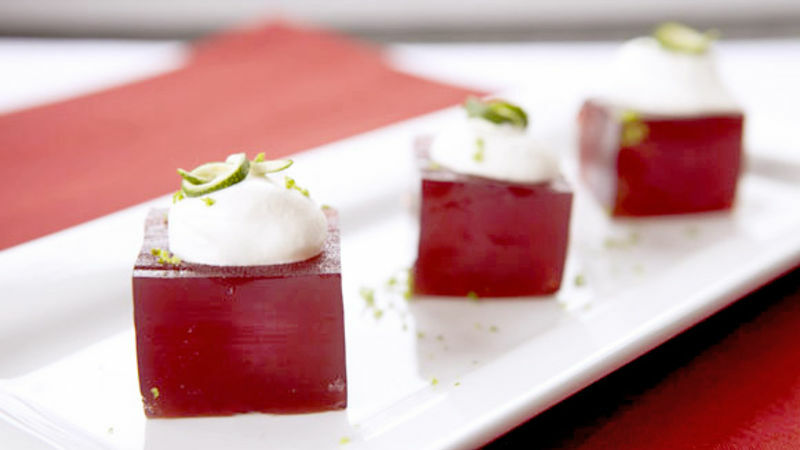 Serve jello shots optionally with whipped cream and lime zest. But they're also great on their own! Is there anything better than a big chilled margarita on a hot spring day? It’s not a rhetorical question and the answer is yes. The thing that just might be better than a chilled margarita is a delicious margarita jelly shot. So I took one of my favorite margaritas and turned it into a pomegranate margarita jelly shot! This recipe is actually very simple. In fact, it’s much easier to make 25 jelly shots than it is to make 25 margaritas. The backbone of the recipe is pomegranate juice, sugar, lime juice, and some gelatin that keeps the shots together. Start by heating the pomegranate juice in a small pan with sugar and lime juice. You just need to heat the juice enough so the sugar dissolves. There’s no reason to boil it or anything crazy. Meanwhile, stir the gelatin into a bit of water. The goal here is just to get the gelatin to start to swell a bit – otherwise it will clump together really badly when you add it to a bunch of liquid. Doing this will basically form a paste of gelatin which will blend into the other stuff much easier. This looks kind of weird, but it gets the job done. If you skip this then you’ll probably end up with some clumps in your final shots. Then carefully pour the pomegranate juice into the gelatin paste and stir it slowly so it blends nicely. Next, the important step. The booze! If you want to make these non-alcoholic you should still add some liquid or the shots will be too thick. You could use club soda or some other sort of clear soda if you wanted. If you are using booze though, triple sec and tequila is what you want. Next, just pour this mixture into an 8x8 baking dish! You might notice there are some bubbles on the surface of the shots. If you let the shots set with these bubbles they will actually harden and not be very pleasing. So I recommend placing some plastic wrap on the surface of the shots and that will smooth out the top layer. These will need to sit in the fridge for at least 5 hours but overnight is best. Then you can cut them into 25 even pieces and serve them up! If you want to get fancy, you can top each shot with some whipped cream and lime zest. These shots are absolutely delicious on their own, though. You don’t need to fancy them up if you don’t want to. They're perfect if you’re hosting a party in the future (Cinco de Mayo anybody?). Give these a try if you’re a jelly shot fan! Nick would like to issue a stern warning about having more than a few of these! Be sure to check out his blog, Macheesmo, and follow him on his Tablespoon Profile.